I heard these words spoken by a venerable black choreographer in reference to the Grand Union, that groundbreaking, influential improvisation group of the early 1970s. 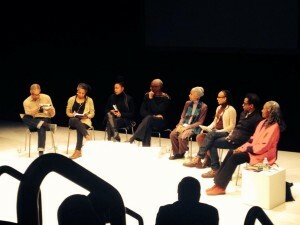 The full sentence was something like, “The only reason the Grand Union was more successful (or more avant-garde) than my group was because they were white.” The claim, uttered during the “Bill Chat” at New York Live Arts last Sunday, met with a nod of agreement from Bill T. Jones. I’ve gotten used to his role as provocateur and can take it in stride, but I was surprised by Dianne McIntyre’s statement. I think the combative tone that Bill T set during this panel, the last of three “Bill Chats,” fostered a kind of reverse racism. I hasten to add that the first two Bill Chats were more driven by Bill T’s curiosity than his determination to “prove something,” and the whole series has served the dance community in that it has sparked both conversation and agitation. Woetzel was articulate and impassioned in explaining Kirstein’s embrace of “orthodoxy” as the one true path. And it was moving to witness Bill T earnestly trying to understand. When the talk was over, I saw Woetzel, Heather Watts, and Robert LaFosse showing Bill how Balanchine’s preparation for pirouettes differs from other methods. (You plié only on the front leg.) Of course, there are many true paths in dance, which I tried to say in this posting. The second Bill Chat mulled over the question, When was the downtown established? Clearly Bill T wanted to open up what could be considered “downtown”: Was Clark Center on 51st Street, where Ailey sometimes rehearsed, downtown? The Cubiculo (which was open to dancers of all colors, including myself)? Could Harlem be considered downtown? Or was “downtown” only the Kitchen, Danspace, and DTW and assorted loft spaces? In my mind, “downtown dance” started with Judson Dance Theater in 1962 at Judson Memorial Church on West 4th Street. (Members of Judson became the nucleus of the Grand Union.) But Bill had specified that he was focusing on the years from 1965 to ’85, so I didn’t bring it up. By the end of this discussion, Bill T declared that he’d like to ban the term “downtown.” I don’t see the menace in this word because I never felt that downtown excluded anyone who was interested. And certainly many professional dancers had no interest in downtown—then or now. In any case, during this second Bill Chat, I learned a lot about the other pockets of dance around the city at that time. The third and last Bill Chat, which posed the question “When did the avant-garde become black?” became belligerent as Bill T goaded people both on the panel and in the audience in an unpleasant way. I was the only “white person” who spoke up voluntarily. I will leave it to Eva Yaa Asantewaa to say frankly how the discussion veered off into a domineering, goading dare-fest that was far from the constructive dialog it could have been. Now, back to Dianne McIntyre and her remark, which I interpreted as denigrating to a group that was consistently mind-blowing during its six-year existence. I feel that the Grand Union’s anarchistic performances caught the feeling of the times, but broke up because the strong individuals within it—David Gordon, Trisha Brown, Steve Paxton, Barbara Dilley, Douglas Dunn—wanted to go their own ways. Without the benefit of longevity and anniversary shindigs, the Grand Union only lives on in what people say about it. Since most of the dance artists on the panel, including Bebe Miller, Ralph Lemon, Ishmael Houston-Jones, Charmaine Warren, and Bill T, arrived in NYC after the Grand Union fell apart in 1976, I’ve written a simultaneous posting for them and anyone else interested in the heyday of experimentalism in New York dance. Click here to find out more about the legendary Grand Union. What I heard Dianne saying was that the reason that groups like Grand Union felt like they could broadcast the fact that they were improvising, rather than her defensive posture of trying to hide her improvisations under the cloak of “choreography” so that it would be taken seriously, was “because they were white.” I personally found it a fascinating insight. Didn’t think she was denigrating GU or their work at all. Merely noting the difference in their public stance in relation to the fact that the work was improvisatory. Thanks for your input. As I said that day, some white improvisors I know feel impelled to use the same cloak of choreography. They will call it “composing in performance” and completely shun the word improvisation. So maybe we all need to do some work to elevate the idea of improvisation, which is just as challenging as choreographing. I guess you should check out http://www.newyorklivearts.org often. Maybe there is a place on their site to join, but I’m not sure it’s a service organization, which is how DTW started. Very much a question, whether NYLA is a service organization or at least has a service componant as DTW did and was. I may be wrong but it seems not. That is a part of the scenario at 219 W. 19th St. that makes me very sad. If I am incorrect, please correct me and my perception. I think NYLA is very much in flux. Many of us are waiting to see what it will become. The “Bill Chats” were certainly controversial, and got a lot of people talking. There are plenty of other service organizations now, so maybe NYLA will become something other than that…. By way of no particular introduction, I was in the position of being a company manager back in ‘the day,’ this being a very specific day, i.e., the early 80s. I think that the reference to skin color plays out in a variety of fashions. Someone will say it, so let’s get it over with, but it was very much the “privilege” of Grand Union and the affiliated artists, to be able to just cut to the chase and call it improvisation. Of course, it was also the desire of choreographers of color to be legitimized and taken seriously in the dance world and the dance market place, so for them it was going to be choreography. It is in some sense it does come down to improvisation being misunderstood. Not to get all Harold Bloom about it, but the “misunderstanding” was often a willful one. As someone who grew up with jazz as very much the musical model, I remember the times that I was told that improvisation was “freedom,” or to make a point, a constant ‘guessing game,’ for lack of a better term. Yet in jazz, the greats were constantly working on their material, building and re-building their construct. I have tended to see that over the years that divide has played out along lines of skin color. As a bit of a side note, some years back and after I had left the business, I remember going to see Douglas Dunn perform over the course of two nights at MoMA’s Sculpture Garden. On the second night, I ran into a friend afterwards and she was quite annoyed with the work, talking about how he had just made it up as he went along. Like that was a bad thing. I was in the position of having seen him work and rework gestured and movements, which I then explained to her. Do you think there was also a music/dance divide? Improvisation in jazz music was such a celebrated thing, and with dance maybe people thought it was a bit lazy, not realizing the skill involved.